Consulting in obstetrics, gynaecology and fertility and delivering exclusively at Pindara Private Hospital. Dr Allanach joins Dr Flynn’s team consulting in obstetrics, gynaecology and fertility and delivering exclusively at Pindara Private Hospital. A graduate of Sheffield University Medical School, Dr Allanach went on to train in Obstetrics and Gynaecology in the United Kingdom, New Zealand and Australia. 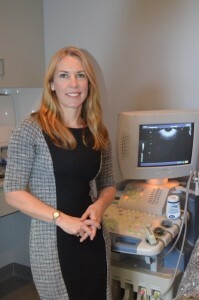 Since moving to Australia, Dr Allanach completed her specialist training in Queensland, was awarded the Gold Medal for outstanding achievement in the RANZCOG membership exams and was subsequently appointed to the RANZCOG board of examiners. She is also an Associate of Royal College of Obstetricians and Gynaecologists, UK. Dr Allanach has extensive experience as an O&G specialist, and having worked in many of Queensland’s metropolitan and tertiary level hospitals, is able to provide the highest standard of care in all aspects of women’s health. In addition to Obstetrics & Gynaecology, Dr Allanach has a special interest in Aviation Medicine and is a member of the Australasian Society of Aerospace Medicine. She is a Designated Aviation Medical Examiner for CASA, for medical certification of private and commercial pilots and air traffic controllers. Outside of Medicine, Dr Allanach has a passion for travel and outdoor sports and has represented hospital teams in triathlon and running events. She enjoys participating in statewide events, most recently completing the Brisbane Marathon in August 2015.